Coburg is known for its fantastic pizza restaurant in town. Coburg is also a gateway to wine tasting along the north segment of the Territorial Wine Trail. Pick up local wines and artisan products at area stores. Coburg Pizza Company brings family tradition all the way from Italy to Oregon with their unique pizza creations. 57 kinds of gourmet pizza taking you around the world on a pizza adventure. From the Margherita Classica to the Bangkok Thai, Athens Greek, Brooklyn Smoked Pepperoni, California Club and BBQ Coburger; all 57 pies paired with their wine and beer guide. Enjoy mouthwatering dessert pizzas, award-winning baked wings, pastas, and gourmet salads. Named 'Best Pizza Place' by Register Guard readers. Also, Nana's Caffé open for coffee, espresso, artisan scones, frittata and breakfast slices. 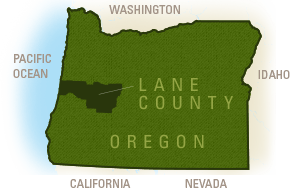 OPENING SOON Lane County's newest premiere vineyard and tasting room. Hayworth Estate Wines is located just three miles (5 km) north of the historical town of Coburg. The tasting room will feature handcrafted Pinot Noir, Pinot Gris and Gamay Noir.